Centuries of development and industrialization have reshaped and impaired our region’s harbor and estuaries. In recent years, progress has been made protecting these intricate and fragile ecosystems, but sea-level rise and more frequent storms threaten to erase these gains—and in fact, further disrupt them. Restoring wetlands, nurturing oyster beds, and providing pathways for migration of habitat as sea levels rise will ensure the harbor and the region’s estuaries remain essential economic, ecological, and recreational resources. 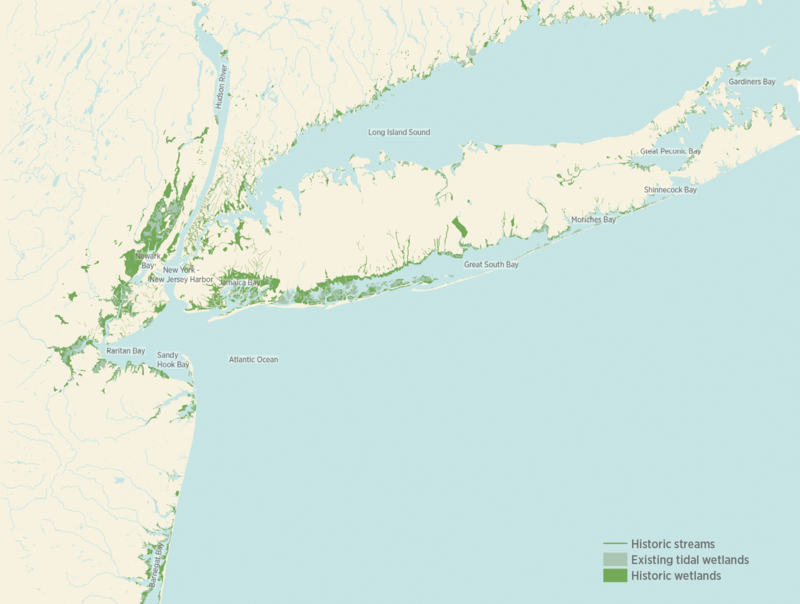 The harbor between New York and New Jersey is part of a vast estuary that has nurtured life and commerce since the earliest human settlement, as have other estuaries along the coasts of Connecticut, New Jersey, and New York. The harbor estuary is particularly complex, comprising more than 30 rivers and streams, including the lower Hudson, Passaic, Hackensack, and Raritan rivers; over a dozen tidal straits, including the East River and a portion of Long Island Sound; and nearly 40 bays, inlets, and coves, including Pelham, Jamaica, Newark, and Raritan bays. These comprise tens of thousands of acres of wetlands, parks, beaches, and piers, support maritime and recreation industries that include the East Coast’s busiest port, and are a critical habitat for numerous species that are essential to the region’s ecosystem. Centuries of development have resulted in the loss of around 78 percent of our historic wetlands in these estuaries; trade and commerce have dredged away habitat from the bottom of our waterways; dams have reduced the flow of water into the system; and industrialization has left behind a legacy of contaminants in landfills, Superfund, and brownfield sites. Thanks to four decades of better environmental policies, parts of the harbor estuary are beginning to thrive again. But the consequences of climate change threaten to roll back the progress that has been made. Increased precipitation will result in greater volumes of stormwater runoff and combined sewer overflows, washing more contaminants into local waterways and threatening water quality. Greater frequency of high-intensity storms will result in storm surges and wave action that threaten fragile estuarine ecosystems. And the rapid rise in sea levels will advance faster than our marshes and wetlands can respond, thus threatening their survival. Increased flooding from storms and rising seas also threatens to unlock contaminants currently held in place in Superfund, brownfield, and other contaminated sites, as well as at landfills in low-lying areas. The changing climate will modify our natural systems and put at risk the economic, ecological, and recreational assets that are essential to the region’s quality of life. A comprehensive strategy for the harbor and other estuaries must maintain existing estuarine habitats; restore lost habitats, including wetlands and oyster reefs, through innovative new projects; provide pathways for wetlands to migrate up-land as sea levels rise; and shore up and clean low-lying contaminated sites at risk of flooding. For each approach, performance standards should be developed, and projects monitored to ensure necessary adaptations are made as sea-level rise and other climate consequences play out. Estuarine habitats, including wetlands and other aquatic vegetation, serve as the breeding grounds and nurseries for many species of birds, fish, and other wildlife, ensuring the continued biodiversity of the estuary. While existing federal and state policies serve to protect most of the region’s remaining wetlands, some remain vulnerable to development. Protecting remaining habitats will require updates to current regulatory mapping (New York State’s wetland maps are over 30 years old); policy shifts (freshwater wetlands of less than 12.4 acres in New York are not currently protected); and additional federal and state investments in acquisition of priority sites and programs to maintain habitat, particularly as the threats from climate change and invasive species will only accelerate. Finally, recent research has uncovered the rich biodiversity of the Hudson Canyon, the 400-mile extension of the Hudson River Valley into the Atlantic Ocean. As we learn more about this critical feature, additional steps should be taken to protect the canyon and designate it as a National Marine Sanctuary. Increasing the amount of wetlands and other estuarine habitats through restoration will not only benefit the natural environment, but also help protect our coastal communities. These benefits include storm-surge absorption, wave mitigation, carbon sequestration, and pollutant trapping. The Army Corps of Engineers should invest additional resources into efforts to restore ecosystems in the estuary, as they are in places like Jamaica Bay and the Hudson River. Buyout programs in the region should also consider restoration opportunities as criteria, and funding should be allocated to support restoration of natural systems, in addition to purchasing and clearing sites. Finally, regulations around permitting should be updated to ensure innovative projects like daylighting streams, and oyster-restoration initiatives like the Billion Oyster Project in New York Harbor, can proceed quickly and easily. It is estimated that one foot of sea-level rise would affect as much as 52 square miles of remaining wetlands in the region, while three feet would affect approximately 80 square miles, and six feet would affect around 106 square miles. Pathways for wetland migration will need to be determined and regulated to ensure the survival of wetlands as seas rise. New mapping efforts, updated policies, land acquisition and protection, and community land-use changes should all ensure pathways for migration exist. State permitting regulations should be updated to enable the adaptation of coastal and estuarine habitat while also protecting communities through the use of living shorelines—the human-made shoreline treatments that mimic natural features that can mitigate the effects of flooding, such as dunes and wetlands. One model for encouraging the use of such techniques is Maryland’s Living Shoreline Protection Act of 2008, which requires soft shoreline stabilization techniques be used for erosion control unless the permit applicant can demonstrate that a harder stabilization technique is necessary. An analysis of remediated and contaminated sites at risk of periodic and permanent flooding should be carried out to determine which sites are at greatest risk of being inundated in ways that release contaminants into the estuary. Contaminated sites at greatest risk should be fast-tracked for cleanup or shoring-up to prevent the release of contaminants. Policies that regulate private sites with chemicals and contaminants should be updated to ensure the consequences of climate change are factored into hazard planning. These policies and practices would lead to increased acreage of protected wetlands; land-use changes that permit wetland migration; more innovative restoration projects throughout the estuary that plan for wetland migration in the face of sea-level rise; and a change in practice around how contaminated sites are regulated and managed. By 2040, we should have a healthy and clean harbor that is ecologically vibrant and supports a growing population, with access to more recreation and maritime jobs, and that helps keep us safe from the storms and flooding from a changing climate. Restoration will require both reprioritization of existing funds and increased resources. A greater share of Army Corps funding should be directed toward natural restoration. The state buyout program and conservation funds should be directed toward protection and restoration of critical estuarine habitat as well as pathways for migrating habitat. Adaptation projects seeking funding through the proposed state adaptation trust funds should receive higher scores for protection, restoration, and migration considerations. Federal and state cleanup funds should be prioritized for sites at greatest risk of inundation and releasing contaminants.